The AT&T Unite Pro (Netgear 781s) uses AT&T 850Mhz, 1900MHz for 3G and 700 MHz Frequencies for 4G LTE. You can boost the reception of your AT&T Unite Pro with an external antenna or powered signal booster. Adding an external to will improve cellular reception which will improve data transfer speeds. Adding a powered cellular signal booster will improve reception even more. The AT&T Unite Pro utilizes MIMO (2x2) Antenna Diversity for a more reliable signal. 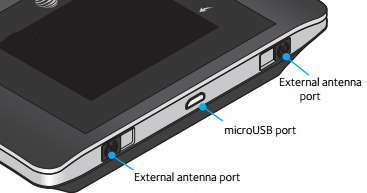 The hotspot has 2 External Antenna Ports. You can attach an external antenna to either port. You can also attach 2 antennas, one to each port.